It was really comfortable to travel to Jaipur by train overnight, from Udaipur. Many had suggested that we should drive to Jaipur and could see a few places en-route, like Nathdwara and Pushkar. We decided to not strain ourselves by long car journey. Moreover we had covered Nathdwara from Udaipur, while Pushkar is nearer to Jaipur and we thought we could make a trip from there, if it could be fit into the schedule. First day at Jaipur was spent with a short half-day trip around the Pink city area. The centre of the city within the main gates and walls of Jaipur old-city have this rule of having all buildings painted in pink, which is the reason for the name. It was painted such during the visit of the King of England and the tradition continues and, in fact, is now in the rule books of the local government. Our first stop was the astronomical center Jantar Mantar. The many scientific instruments (yantras), built by the Rajput king Maharaja Jai Singh II in early 18th century, are simply awesome. Practical approaches of using the instruments have been taken into consideration along with precision for making the readings. Jaipur's latitude and longitude has also been taken into consideration for accurate measurements. 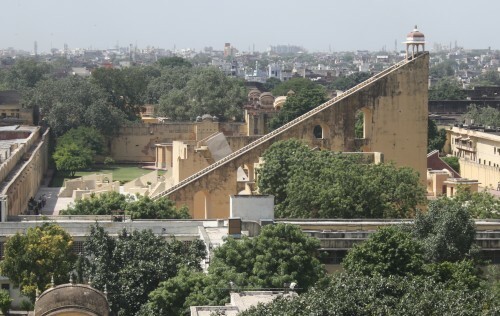 Since we engaged a guide, it was very useful to understand all the instruments built at Jaipur Jantar Mantar. Some of the instruments have a precision of about 2 seconds and other instruments provide further information and aspects of zodiac. The Jantar Mantar in Jaipur is the best and encompasses maximum number of instruments, amongst the many built across north-west India. The next stop for us was the City Palace and Museum, which is adjacent to the Jantar Mantar. The medieval collection of the variety of transport, dresses, utensils, equipments and weapons are well preserved and presented for the public. Again, the help of a guide was very useful in getting to know the facts and history of the palace and the maharajas. Though there are some exaggerations and personal opinions that are slipped in, it is worthwhile to employ a guide at most of these places. Near these two places is the famous Hawa Mahal (palace of winds). The rows of rooms along a single line, rising 5-6 floors, look quite simple. The winds in the rooms through the engraved windows of the rooms are indeed surprising. 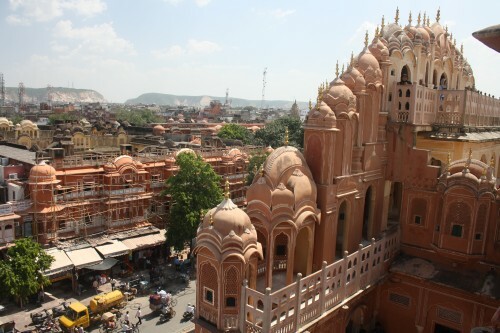 From the Hawa Mahal, one can have a good view of the market, Jantar Mantar and City Palace. We decided to rest for the afternoon and walked along the market for some window shopping in the evening. The sweets in Jaipur are pretty enticing. Huge portions are available at a very nominal price - in some cases about 1/4th of the price of same item in Chennai! We were enticed to sample them after every meal and thoroughly enjoyed it. One can return to the city, not only for the cleanliness and people's camaraderie, but also to enjoy the cuisine and sweets. Hi Grat Your Blog,Thank's for this helpful information come back again for more interesting information!!! Nice Information of Jaipur. 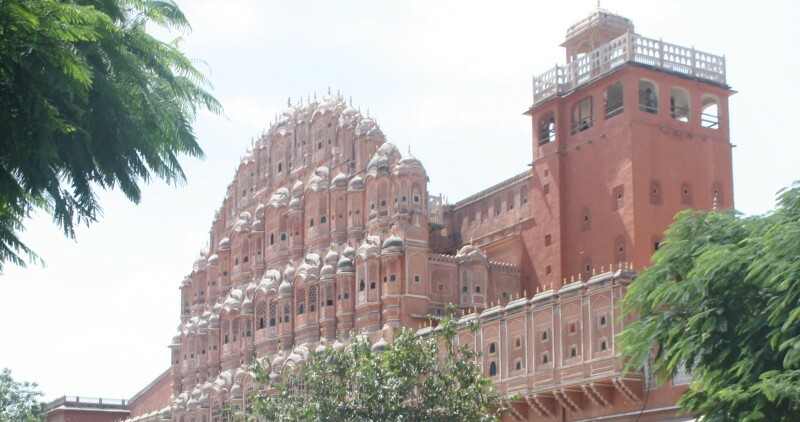 Jaipur is also called as pink city and it is famous city in north india. Jantar Mantar, Hawa Mahal are the best places in jaipur. Looking for best North India Vacations then visit splendourholidays.com, it offer affordable travel packages and make your holiday interesting. Very impressive blog, As one gets a chance to explore India, Golden triangle packages india India with Goa as one more included destination is indeed the best one can get. Thanks for writing about your Jaipur travel experience. The Pink city is definitely worth visiting once. For accommodation, one can chose to stay at hotels in Jaipur offering all the modern facilities to their guests.